One of the ways for you to go green within your house is by reusing your old wood pallets that is also an inexpensive method to apply them in your house. Your old wood pallets can contribute a lot in order for you to create a green concept house. For example, you could reuse a large amount of your old wood pallets for building an outdoor shed as well as constructing an ecologically friendly home or even you can also reuse just one or two of your old wood pallets for other kinds of usage as mentioned here. Make sure that you check your old wood pallets thoroughly and ensure that its horizontal wood strips are sturdy enough for you to use it as your daybed foundation. If it is necessary, you should reinforce the pallet with additional wood screws. Then, you need to place a twin bed mattress along with box springs on top of two wood pallets that you laid side-by-side lengthwise next to a wall. Your daybed should use bedding with neutral linen and a coverlet. You can also add a few accessories like using throw pillow on top of the daybed to be used as a backrest. Firstly, you must make sure to clean the wood pallets thoroughly. This is because you do not know where exactly the wood pallets came from. The wood pallets is an absorbent material and can be harmful to you especially if it brings together with it bacteria like E.coli. You must use a cleaner especially made for disinfecting your wood pallets. You should dismantle your old wood pallets by using a crowbar and a handsaw. The wood from the pallets can be reused to assemble a simple rectangular wood planter. Then, you have to cut two wood strips with the same lengths for the sides. After that, cut another two smaller pieces with the same lengths for the end of your wood pallet planter. Next step for you to do is to cut one additional length of wood having the same length as your side pieces to be used for the bottom side of your planter. You should be using carpenters square, wood glue, brad nails along with a hammer in order to attach your side pieces onto the end pieces. You must make sure that the corners are square. The bottom side of the planter needs to be attached lastly. Then, you need to finish the planter with latex paint or even using a stain if it is necessary. You can set a few flowering pots inside your planter and enable you to create visual interest plus also adding more height to your garden. Another step that you can do is to break off sections of your old wood pallets so that you can create primitive wood signs for your house or even make the signs to be given as gifts. You can use simple lettering that can be traced from a printed page of your computer font. You can also use transfer paper and a dull pencil in order to outline the letters. The letters can be filled with latex paint and a small art brush. After that, you should spray a clear coating of polyurethane on your recycled pallet wood in order to protect the finish look on the sign. Finally, you have to drill two holes on top of the sign and then thread a length of 22 gauge galvanized wire through the holes that you have made and make sure you coil the ends of the wire using a needle nose pliers. This is to make sure that it is secured and firmly in place just like a hanger. Another thing that you can do with your old wood pallets is to make it into a collapsible table. Firstly, you need to paint one pallet along with four concrete blocks using white color paint. Then, place your pallet on top of the four blocks of concrete. Make sure you place one block each under the corner of the pallet. You can also add an unused rustic coffee table that you can take down easily if you have one at home. Another option that you can think off is to create an outdoor art table for your children. The table can either have legs or even lay it on the ground. You need to paint the pallets with your preferred color. Then, take a piece of oak wood that you can cut into a circular shape that can fit the top of your pallet. Next step for you to do is to paint the top piece of wood. Once the paint has dried thoroughly, you can cover it using a plastic table cloth. Your outdoor art table is now ready for you to place art materials such as sand buckets full of art supplies and also other items related to art. You can always check with your local discount store or home improvement as well as grocery store to inquire whether they have any unused old wood pallets that they want to sell. 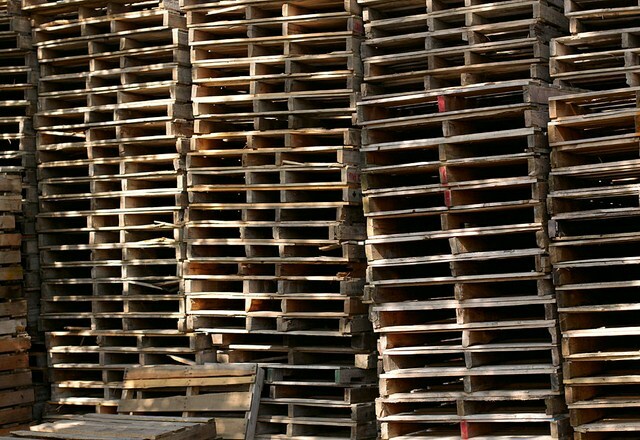 Some stores might offer their old wood pallets for free but you must seek their permission prior to removing any of the unused pallets. You can also turn you old wood pallets into creative items such as pallet guitar, modular pallet furniture, pallet garden furniture, beer bottle pallet clock, wood pallet bike trailer, pallet garden box, repurposed pallet Adirondack chair, pallet sphere or even recycled pallet playhouse. This entry was posted in Home Improvement on December 15, 2011 by Mike.